Sisters Danielle and Ariel Tredway are making their mark on country music's fashion scene with their custom corsets. Photos courtesy Danielle and Ariel Tredway. Danielle and Ariel Tredway’s rendition of the corset is a vast departure from the original 16th century undergarment. Still designed to elegantly boost a woman’s figure, these modern masterpieces of fashion architecture aren’t the constricting versions of yore. Each of the Tredway sisters’ corsets is an artful design with intricate details to create a centerpiece in a woman’s outfit – corsets that are meant to be flaunted on the outside. Relatively fresh out of college, in 2011 the Steamboat Springs natives moved to Nashville and founded a corset atelier, Ani&Ari. They now operate the custom corset business out of their own retail store. Ariel, 22, recalls how the economic recession provided impetus for them to apply creativity to their entrepreneurial endeavors. “We were both in kind of a desperate time because we graduated college during one of the worst economic times ever. So we needed to find a way to make money,” she says. While pursuing a degree in fine arts at the Art Institute of Chicago, Danielle, 26, received encouragement from an instructor who specializes in lingerie design. This channeled her passion and experience with sculpture into corset design. Both of the Tredway sisters have a stake in their products’ designs: Danielle runs the sewing operation and Ariel is in charge of inventory and marketing. Their custom, handmade corsets have been especially popular among country music stars, including Carrie Underwood, Miranda Lambert, and the Pistol Annies. “We never thought we’d be associated with the country music industry. But corsets are perfectly showy enough for country singers,” Danielle says. The “custom” component of Ani&Ari has a two-fold meaning. The Tredways work closely with their clients to design products that speak to individual tastes – often combing the world of fashion and even upholstery for rich, luxurious and unusual fabrics. They also take 30 measurements for each client in order to ensure a perfect fit. 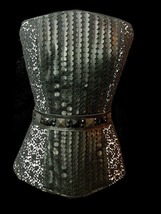 Prices range from $150 to $4,500, contingent upon the amount of time it takes to assemble an individual corset. When Kassidy Fischer was chased through the Park Meadows Mall by a model scout, she was not in the mood to stop and chat. “I was fighting with my mom and this woman came up to us and asked me if I ever thought about modeling. I just said ‘no thank you’ and kept walking. But she followed us until I heard her out,” Fischer says with a laugh. Now 17, the Steamboat Springs native has earned some of the most coveted jobs in the industry. She has walked the runway twice at the high-profile L.A. Fashion Week and posed for big name magazines and companies including Tinsel Tokyo Magazine, Hot Topic, and John Frieda. Having done a variety of modeling work, including runway, catalogue and editorial, Fischer says editorial is her favorite because it typically allows for creative license. With six years of experience and learned independence, Fischer now spends the majority of her time in Los Angeles, where she lives in an apartment with other models. Although she has seen much success, she admits that the industry can be demoralizing at times. “You have to have thick skin. I’m so used to people being brutal about it. You just can’t really let it phase you because there are a lot of lows, but also a lot of extreme highs,” Fischer says. Fischer’s career gained momentum last spring when she signed with CW Management, which helped her secure a contract with top modeling agency, Click Talent. On some days, she attends up to four different casting calls. Despite working in such a demanding, fast-paced industry, Fischer remains down-to-earth and positive. She attended Steamboat Springs High School her freshman and sophomore years and is currently enrolled in online high school from which she receives high marks and will graduate next semester. In the distant future, when she retires from modeling, she’d like to be an elementary school teacher. For 18-year-old Logan Banning, starting college this fall not only means new friends and experiences, it also marks an opportunity for him to expand his business to another region of the country. 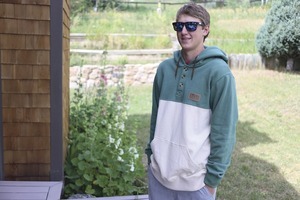 In 2011, the local entrepreneur founded Parka Apparel, a clothing company specializing in handmade tri-colored hooded sweatshirts that cater to skiers and riders. Since then, he has sold an estimated 300 hoodies and expanded his venture to include t-shirts and hats. In preparation for his transition to Lehigh University in Bethlehem, Penn., Banning is maximizing his product inventory and exploring his marketing options. In Steamboat, he has taken a multifaceted marketing approach. While he accepts custom orders that allow him to sell direct-to-consumer, he has also found success in selling his clothing through local retail stores like Urbane, All That Jazz and Steamboat Hat Company. Having a natural enthusiasm for “making things better,” it’s logical that Banning is entering college as an engineering major. An appetite for product improvement is what inspired him to try his hand at designing apparel. “I saw a friend wearing a custom sweatshirt and I thought I could make a better one,” Banning says. After experimenting with some materials from Walmart, Banning upgraded to a small textile manufacturing company in Denver. His distinctive hoodies usually follow a pattern of diagonal lines, but colors vary with each product. The assembly process involves cutting apart two or three sweatshirts and sewing portions of those sweatshirts together to create a finished product. In addition to his unique patterns, Banning’s sweatshirts are recognizable by his characteristic Parka logo. While Banning plans on bringing some of his products to college to stimulate an East Coast client base, he questions the practicality of having a large sewing machine in his dorm room. Summer saw him sewing like mad and working on adapting his company to another culture. “Now that I’m moving on to the East Coast, I want to move towards street wear,” he says. In the third grade, Jessy Dover installed a feature on her ski goggles to counteract that perpetual layer of lens fog. It was the beginning of her design career. “I was a ski racer and I decided that it was a huge issue that goggles were always fogging up. So I added these miniature windshield wipers that moved when I pulled this string,” Dover says with a laugh. Today, Dover, 25, lives in New York City where she and two partners launched Dagne Dover, a high-end handbag business, in July. 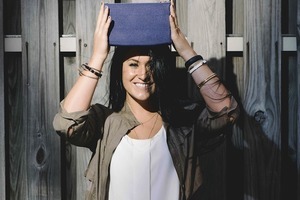 While she was a student at Parsons The New School for Design, Dover won an internship at the sought-after Coach handbags via a design contest. At Coach she gained valuable insight into both the creative and business components of fashion design. It allowed her to network and meet her Dagne Dover cofounders. Now Dover is their creative director, which makes her responsible for everything from product and web design to photo shoots. Photo by Evan Robinson Photography. With its various specialized compartments including a water bottle holder, a detachable key strap, and cell phone and laptop sleeves, the tote is intended to carry a woman’s essentials from day to evening. Its chic canvas and leather exterior is also conveniently waterproof. The products are assembled in New York’s Garment District, but the individual material components come from all over the globe.